The Microsoft Outlook inbox is one of the major destinations for most email senders, especially those with large numbers of consumer subscribers. It also has a reputation for being somewhat tricky to get into. Here’s what senders need to know to get the best Hotmail/Outlook deliverability and ensure their messages reach the inbox. 1. Warm Up New IPs – Microsoft will only allow 10,000 messages per day for new IP addresses. It will delay the remainder of messages sent from new IPs. Delays are normal when developing an IP reputation. As your reputation develops over a 2–4 week probationary period, the delays will lessen and eventually discontinue. The volume of messages that are delivered successfully on the first attempt will rise as Microsoft moves you to a higher reputation level. Best Practices: to avoid delays, start with 2,000 traffic to Outlook/Hotmail, double every day until you see “RP-001 (DYNAMIC CODE) Unfortunately, some messages from a.b.c.d weren’t sent. Please try again. We have limits for how many messages can be sent per hour and per day. You can also refer to http://mail.live.com/mail/troubleshooting.aspx#errors.” then slow down the traffic until these delays discontinue.” Note: We highly encourage senders to use their own “custom bounce domain”, “tracking domain” and “dkim sign” with their own domain. 2. Listen and Respond to FBL Complaints – It is important to honor any unsubscribe requests whether a subscriber hits the spam button or the unsubscribe link. Continuing to send to subscribers that have unsubscribed will harm your reputation with Microsoft. SparkPost applies for and processes Feedback Loop (FBL) complaint feedback for you to minimize this risk. Best Practices: Add text reminding subscribers where they opted-in to receive your message. Ensure your messages are relevant and sending at a frequency that the subscriber is expecting. Remove subscribers that do not engage with your messages. If as little as 0.5% of your subscribers complain, it will affect your ability to send to your entire subscriber base. 3. Minimize “Unknown User” Hard Bounces – Do you practice positive list hygiene? Are you sending to an old list that includes a large number of inactive or dead addresses? Microsoft sees this as a sign of email harvesting or spamming. Best Practices: Practice list hygiene by maintaining your list. Purge addresses that have been inactive for 12 months, change the frequency to addresses 3 to 6 months old. Consistently attempt to re-engage subscribers using different tactics. Normal unknown user rates average less than 2 to 3 percent. 4. Avoid Spam Trap Addresses – Addresses used by ISPs and law enforcement agencies to identify email harvesting/spammers. Best Practices: Maintain list hygiene with hard and soft bounces. Bounce notices can provide invaluable information about how Outlook (or any provider) is treating your messages. It is critically important that you keep spam trap rates below 0.01% to avoid reputation issues. 5. Properly Configure Your Sending Infrastructure and Content – Microsoft looks for well set up infrastructure and aligned content as an indicator of a good sender. Microsoft also applies a proprietary content filter called SmartScreen. SmartScreen learns from data provided regarding known phishing threats as well as from Microsoft customers to determine what characterizes good mail and unwelcome mail. Filtering is accomplished by probability-based algorithms used to distinguish between legitimate e-mail and spam. Best Practices: Always use valid, reputable URLs. Avoid using IP addresses in the URL. Publish your Sender Policy Framework (SPF) records. Focus on content, as well as URLs and HTML elements. 6. Sending Frequency and Consistency – Sending from the same IP address(es) with consistent volumes and frequencies month over month is ideal. Spammers tend to “pop up” on an IP and disappear. Infrequent senders who send large volumes once a month or quarterly can be an indicator of a spammer or a compromised server. Best Practices: Be consistent. Segment your sends. Prioritize sending genuinely wanted content to a smaller number of engaged subscribers over sending generic content to your entire list. Include your call to action early in your content so subscribers will see it quickly as they scan your message. Avoid link shorteners like bit.ly and align your links with your content. Personalize your content to your subscribers’ interest. Don’t send the same content to your entire list, but instead but segment and personalize using dynamic content. 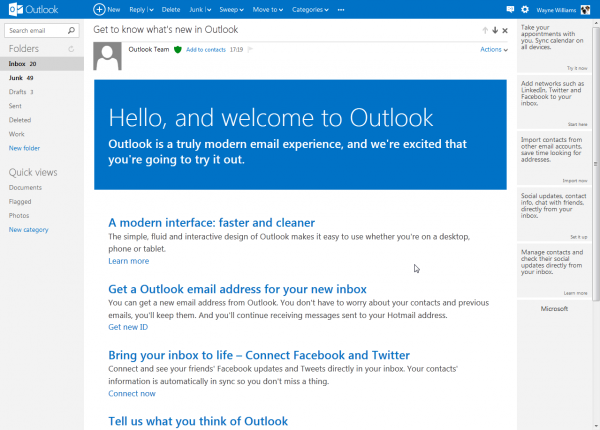 Overall, Microsoft has incorporated content filtering with authentication and reputation for a combined “trustworthy” score with which it determines how to handle messages and determine Hotmail/Outlook deliverability. So the simple answer is to follow best practices consistently. Send to only subscribers the content that they expect, when they expect it. That’s the golden rule of email deliverability to Outlook or any ISP. For more information about Hotmail/Outlook deliverability straight from the source, visit the Microsoft postmaster page. Maybe you can just tell us how to handle this (big!) issue, instead of some general clues. Since we face this problem, even though we address all your points. For us this really is a big show stopper for using SparkPost. What can we do NOW? Do we have to wait for you to fix it? Do we need to get a dedicated IP? What can we do about the problem that SparkPost emails are not arriving at hotmail and other Microsoft accounts? If you are following best practices by sending to subscribers that have expressly opted in to your communications, sending only the subject matter your subscribers expect at a frequency they expect, sending more than 100k each month and are still not getting inbox at all ISPs you should get a dedicated IP and use custom bounce domains as well as custom click tracking domains. This will separate your reputation from that of other senders in the shared environment. We are currently working to resolve the Microsoft issue, however there is no magic switch. Hi, we switched abruptly from Mandrill, and of course didn´t have the oportunity to schedule 2K emails one day and doubled it each day later, we did it one day to another and quickly all our email messaging were moved to your SMTP Injection API. In Mandrill we never had this issues before, now frequently (every some hours) we have delays or what I call “false bounces” reporting “We have limits for how many messages can be sent per hour and per day from a.b.c.d” delivering to Outlook accounts; we reported this and your tech staff guys told me that the issue was resolved. BTW, we almost never receive spam complaint from our users, this is not an issue about sending what matters to users. I don´t expect you to force me to get dedicated IPs when never before used one. Instead I am expecting your IPs to warm for some week (combined with my sending domain, I pray for), and soon I will use custom bounce domain. You should improve something at your side. on this subject, but you seem like you understand what you’re talking about!